The comment made on my recent blog about my atheistic nature had me thinking. The argument made was that as an atheist holds firmly to a non-belief, ipso-facto they must believe. I feel this sort of missed the point of my post in that religion was never an issue. It wasn’t presented, addressed, or even required. It was not a concept that had any intellectual substance that could be believed in. I didn’t consider a disbelief in a God any more than I considered a belief. It wasn’t a matter that I every really pondered, until recently. It simply wasn’t a part of my awareness. I had heard biblical tales and such, but there was never a requirement that I should or should not make a choice as to their relevance to my life. Neither the act of disbelieving or believing was something I actively did day-to-day. I simply… lived. I certainly didn’t lack leadership, having witness both good and bad leadership. Teachers I saw as role models, or as monsters. A father who frightened me, yet inspired me. Peers who I would find connection with, and those who rejected me. In none of these experiences was religion, nor God, a feature. Neither was the rejection of religion, nor God. It was simply life; unpredictable, and evolving. Nor was non-belief forced upon me. I was never told what I should and shouldn’t believe. I was never told to believe period, and by this I mean religious belief. 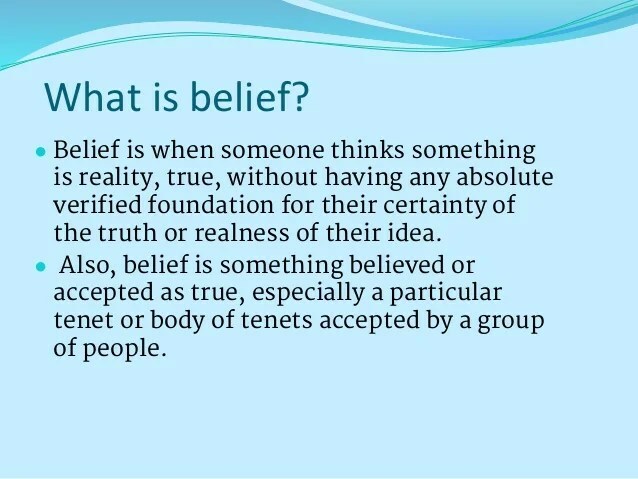 What is Belief? Now I believe in things. I believe that my daughter is bloody intelligent. I believe that she is possibly the most happiest person I know. I believe she will have tough times, and I believe she will survive. I accept the common term that is belief in something. To me it means possibilities. I believe it is likely that something is, or will be, but I acknowledge that I do not believe absolutely. What life has taught me, what I have taken from my experiences, is that nothing is absolutely certain, and the void that we do not yet know is where we project possibilities. This unknown can either be an end to the road, or inspiration to look a little further. So if I believe in anything, it is that one day we will know things better. Not with absolute certainty. With a degree of confident certainty. As for religion, it is not something that has ever played a part in my life, either through faith, or active denial. I have lived most of my life without any need to contemplate. It was not until my daughter asked “What should I believe in?” that I even felt it was worth contemplating. This was the last item that my concerned commentator asked. Love is nebulous. It is a little mysterious, and sure, we don’t have any clear definitive explanations for where this comes from, nor the other human emotions. Not that love, hate, joy, depression is exclusive to humans, as we can see demonstrations of similar physical presentations in other life around the world. Yet I have heard philosophical concepts for love that utilise evolutionary or biological concepts, as well as more spiritual, and religious concepts. They are possibilities based on either things that we have discovered to date, or concepts that are, for now, beyond the realm of proof. I feel a large reason for this uncertainty is that the definition of love is itself vague and often a matter of personal opinion. But I, for one, am more intrigued to find out what it really is, than to attribute it to something I have no reason to contemplate, which is my I associate with an absolute belief. Which presents a problem. As I have no true religious experience, can I really comment of what it means to be religious? Not really. Therefore I can’t really “judge” another person’s belief. As I have said in previous blogs, I choose not to judge a person based on the choices and beliefs they have. Each person has the right, and the power to choose for themselves. As I see it, the experience of Love is not the same for everyone. Some people may even fear it for various reasons, and this is before you account for traumas and damaged psyches. To attribute Love as God, I would feel inclined to asked, then why does God not make it a consistent experience for all? And if God is Love, do other deities exist for the other mysterious emotions? I am not trying to be facetious with these questions, it is just questions I have asked myself in my own little thought bubbles. I do not know what causes feelings of Love, but I do consider that these feelings have, from an intellectual standpoint, beneficial evolutionary associations. That we love, means that we are socially inclined to find like individuals, and co-exist with them for a period of time, which helps increase chances of survival. This would be useful in an environment where survival was less certain otherwise, something which is not so relevant today… so does that mean that sometime, in the distant future, we may not love any-more? These are just the questions I ask myself as I ponder what it means to be me. Reblogged this on Reflection of an Atheist.